The core protein first assembles in dimers and the c-terminus is phosphorylated. The phosphorylation is important both for capsid assembly and polymerase-pgRNA encapsidation (Gazina et al. 2000 ) Rating=2 (Melegari et al. 2005 ) Rating=2 (Kang et al.2008 ) Rating=1. Specific packaging is not based on a capsid-RNA interaction (Porterfield et al. 2010 ) Rating=2, but could be based on polymerase-pgRNA interaction. Phosphorylated dimers assemble into T=3 or T=4 icosahedral capsids (Dryden et al. 2006 ) Rating=2. A study has shown that 31nm wide T=3 capsids are transiting better through an 40nm artificial pore than the 36nm wide T=4 capsids (Zhou and al. 2011 ) Rating=1. 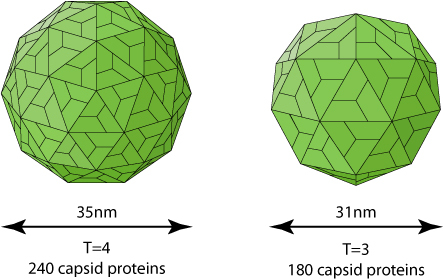 It is unusual for an icosahedral capsid to be assembled with variable triangulation numbers. The only case described concerns the caliciviridae, which naturally form T=3 capsids, but also T=1 virus-like particles (VLP) which would be involved in immune response and/or encapsidation of a subgenomic mRNA. Tombusviridae also can make T=3 and T=1, but the latter has only been described ex vivo. Released virions are enriched in T=4 symmetry. The function of T=3 if any remains elusive. In both caliciviridae (Barcena et al. 2004 ) and Tombusviridae (Katpally et al. 2004 ) the inner surface of the capsid protein would determine the triangulation number. HBV capsid C terminus interacts with the RNA genome, and is exposed in the interior of the icosahedron. This C terminus might regulate the amount of T=3 capsid, as it is highly disordered and displays various patterns of phosphorylation.